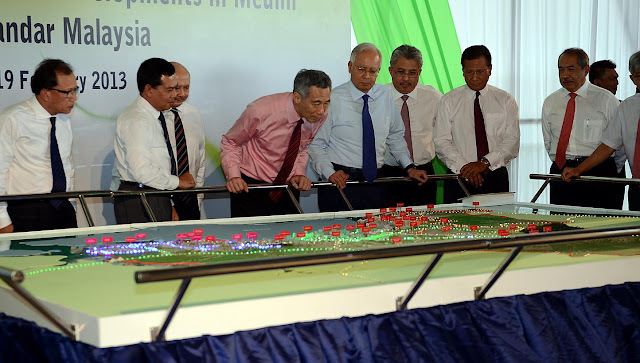 APRIL 1 — Since 2013, plans have been underway to build South-east Asia’s first High-Speed Rail (HSR) connecting Singapore and Kuala Lumpur. It is expected to slash travel time to 90 minutes and connect the two cities as never before. Many details of the project — estimated to cost upwards of S$20 billion (RM57.7 billion), with a roll-out date of 2023-2024 — have been decided, including the location of stations. Still, key questions remain: Where will the financing come from; how will the project be structured and contracted out; and, of course, who will land the construction job. The proposed 350km line will run mostly above ground in Malaysia and underground in Singapore. It will begin in Bandar Malaysia, some 7km from Kuala Lumpur City Centre, and end in Jurong East in Singapore. The train service will run at an average speed of 250kmh, reducing travel time between the two cities to 90 minutes — compared to 7 to 8 hours currently by train or 4 to 5 hours by car. A slightly longer trip lasting two hours, stopping at smaller cities in Malaysia such as Seremban, Ayer Keroh, Muar, Batu Pahat and Nusajaya is also envisaged. The HSR is expected to run up to four times an hour, of which one will be the direct service from Kuala Lumpur to Singapore. A one-way ticket between the two cities is to cost an estimated S$60-65, which is about three times the cost of a bus trip, but cheaper than budget air travel. In October 2015, Singapore’s Land Transport Authority and Malaysia’s equivalent — Suruhanjaya Pengangkutan Awam Darat (Spad) — launched a request for information from interested firms. 98 firms and consortia from China, Japan, Korea, as well as a number of leading European transport firms registered their interest. Of these, 14 were shortlisted. But first, there are a number of issues that need to be settled. Will Singapore and Malaysia contribute equal proportions of the necessary capital? Given that only 4 per cent of the total track will be on Singaporean territory, this seems unlikely. One way out of this impasse is for a Build-Operate-Transfer arrangement, where the cost is incurred by an external provider in return for an extended concession. Given the sheer magnitude of the project, it is likely that both governments will need to make a financial contribution of some magnitude. One option is to have public financing for the civil infrastructure, and a public-private partnership arrangement for the train services. Another issue is how the project will be let to tender. Will both countries operate one bidding process and jointly choose a service provider? Or will Singapore and Malaysia carry out their own bidding processes and separately supervise construction on their own soil? Should this be the case, the infrastructure would then need to be joined and integrated — an additional complication. Lastly, irrespective of whether the project is handled jointly or separately, will the tender(s) go to consortia comprising specialist companies with different expertise, or will the project be broken down into smaller packages that are managed separately? Furthermore, the relationship between the direct KL-Singapore express and the commuter service has yet to be finalised. While the direct route is important for Malaysia, the second service will link up secondary cities that are as yet not served by any rail service; and enable daily commutes to KL from Seremban and Ayer Keroh. Indeed, according to Malaysian planning documents, the KL-Singapore line is part of a planned railway network that will go all the way to Thailand. In addition, the commuter service will also allow Prime Minister Najib Razak to frame the project as one that primarily benefits Malaysia. Singapore, for its part, is focused on the direct service. These issues are likely to be high on the agenda for the 7th Singapore-Malaysia Leaders’ Retreat to be held in Malaysia in the middle of this year. Lastly, while the Najib administration is solidly behind the HSR, the parliamentary opposition is not. They have said that they would prefer to invest the money in connecting Sabah and Sarawak by rail, arguing that these two states are in greater need of transport links. As land management is a state government responsibility, the opposition-controlled government of Selangor can delay land acquisition in and around Kuala Lumpur if it wishes to do so. 2016 will be a crucial year for the HSR, as leaders from Malaysia and Singapore sit down to iron out the technical details of the project. The recent decline in oil prices has hit Malaysian government revenue hard and the 2016 budget has had to be revised. Rather than delaying the project, however, it may tilt the balance towards a different financing scenario. One option could be a Build-Operate-Transfer arrangement, when an external party provides the upfront funding in return for a lengthy concession. Should this be the case, it would thin the ranks of potential bidders to the select few with deep pockets. Assuming that 2016 is spent finalising the details, the design and tendering processes will occur in 2017. This period will see the greatest amount of movement, as international and local consortia seek to pre-position themselves and subsequently adapt to the structure and conditions of the bidding process. The Japanese and Chinese governments have started lobbying for the contract. If the eventual winners of the bid do not need to raise capital, construction can begin in 2018. The early years of the project will be spent on land acquisition and surveying. Land issues may take longer to settle and be more costly than anticipated. Much of the track will run through prime plantation ground in the south of Johor before hitting residential areas closer to Kuala Lumpur. The HSR will pass through Johor, Malacca, Negri Sembilan and Selangor, which means that four state governments must be brought on board to handle land issues, adding more players in the equation. * Dr Francis E Hutchinson is senior fellow and coordinator, Regional Economic Studies Programme at ISEAS Yusof Ishak Institute. This piece is adapted from a longer piece in ISEAS Perspective.